Animals have used the same technique to search for food that's in short supply for at least 50 million years, a University of Southampton-led study suggests. Researchers analysed fossilised sea urchin trails from northern Spain and found the tracks reflect a search pattern still used by a huge range of creatures today. But this is the first example of extinct animals using such a strategy. The findings could explain why so many modern animals use the technique, and suggest the pattern may have an even more ancient origin. Creatures including sharks, honeybees, albatrosses and penguins all search for food according to a mathematical pattern of movement called a Lévy walk – a random search strategy made up of many small steps combined with a few longer steps. Although a Lévy walk is random, it’s the most efficient way to find food when it’s scarce. David Sims, Professor of Marine Ecology at the University of Southampton and lead author of the study, says: “How best to search for food in complex landscapes is a common problem facing all mobile creatures. Even though a wide range of modern creatures search for food according to this pattern, scientists had no idea how the pattern came about, until now. Professor Sims and colleagues from the University of Southampton, NERC's National Oceanography Centre, Rothamsted Research, VU University Amsterdam and the Natural History Museum analysed the fossilised Eocene-era tracks that were made by sea urchins that lived on the deep sea floor around 50 million years ago. The long trails are preserved in rocky cliffs in a region called Zumaia in northern Spain. “The patterns are striking, because they indicate optimal Lévy walk searches likely have a very ancient origin and may arise from simple behaviours observed in much older fossil trails from the Silurian period, around 440 million years ago,” he adds. 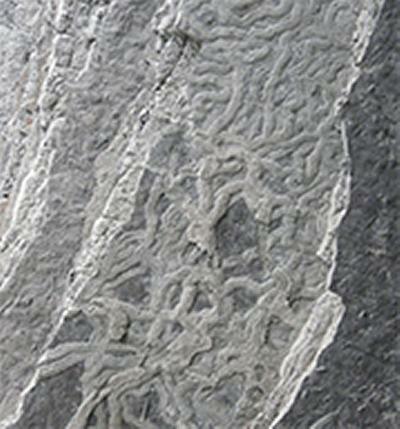 Professor Richard Twitchett of the Natural History Museum and co-author of the study adds: “It’s amazing to think that 50 million-year-old fossil burrows and trails have provided us with the first evidence of foraging strategies in animals that live on and in the deep-sea floor – studies which would be nearly impossible and very expensive to do in modern oceans. The researchers think the collapse of primary producers, such as phytoplankton, and widespread food scarcity caused by mass extinctions, which show up in the fossil record, could have triggered the evolution of Lévy-like searches. The Eocene lasted from 56 to 33.9 million years ago, and began as a time of global warming, with temperatures soaring across the planet. Lévy walks aren’t just confined to animals; our ancient hunter-gatherer ancestors used exactly the same approach, as do modern hunter-gatherers in northern Tanzania. The study is published in The Proceedings of the National Academy of Sciences and Planet Earth Online. Funding was provided by the Natural Environment Research Council Strategic Research Programme Oceans 2025, the Leverhulme Trust, and a Marine Biological Association Senior Research Fellowship. This work was also supported by the Biotechnology and Biological Sciences Research Council.